The Skolkovo innovation city welcomed a large delegation from the Belgian city of Antwerp this week, at which the two sides established areas of cooperation and one Skolkovo startup won the chance to launch pilot projects at Antwerp companies. 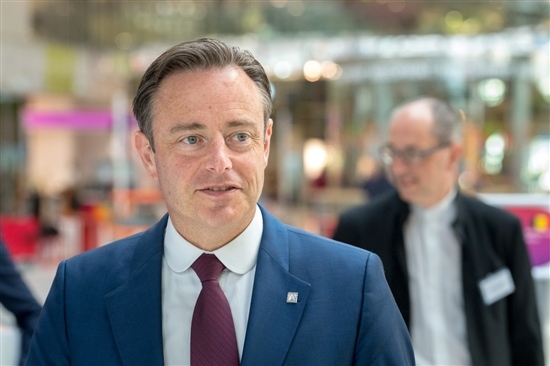 The 100-strong delegation was headed by the mayor of Antwerp, Bart De Wever. Photo: Sk.ru. CPS Lab, which creates automated solutions for companies that enable them to monitor and increase the efficiency of employees' work, was one of four Skolkovo startups that pitched its product to the delegation, which comprised about 100 representatives of Antwerp businesses, the city administration and the University of Antwerp, and was headed by Antwerp Mayor Bart De Wever. The company was chosen by the Belgian side to go to Antwerp for a month this autumn at the city’s expense and implement pilot projects in several major regional companies. As a city that is positioning itself as a forward-looking innovation hub, Antwerp’s government and businesspeople were very interested in visiting the Russian innovations capital, said Guido Muelenaer, manager of strategy and innovation for the city of Antwerp. “For the city of Antwerp, innovation is the red line in its economic policy,” he said during a meeting with representatives of the Skolkovo Foundation at the Skolkovo Technopark on Monday. Guido Muelenaer, Antwerp's manager of strategy and innovation, presented the city's innovative economic policy to representatives of the Skolkovo Foundation at the Skolkovo Technopark on Monday. Photo: Sk.ru. Several things traditionally made Antwerp the “economic engine of the Belgian economy,” Muelenaer said at Monday’s meeting: it is the second largest port in Europe (after Rotterdam), it is home to the number one integrated oil and chemical cluster in Europe, and it is also a world diamond centre, with 85 percent of rough diamonds and 50 percent of cut stones passing through the city. Now, however, Antwerp is looking to build on these traditional cornerstones of the economy to transition to what is known as the “next economy.” To do this, it is focusing on two aspects: digital innovation (smart port and logistics, ehealth, smart mobility and industry 4.0) and the circular economy (sustainable building and renewable energy, among other things). The city’s Capital of Things project is an Internet of Things initiative by the University of Antwerp, the port and the city, while Imec – a nanoelectronics and digital technologies innovation hub whose representative was also present during the visit to Skolkovo – is building what Muelenaer described as “Europe’s largest Internet of Things Living Lab” in Antwerp. “We have the ambition to become an IOT landmark in Europe,” he told the meeting. 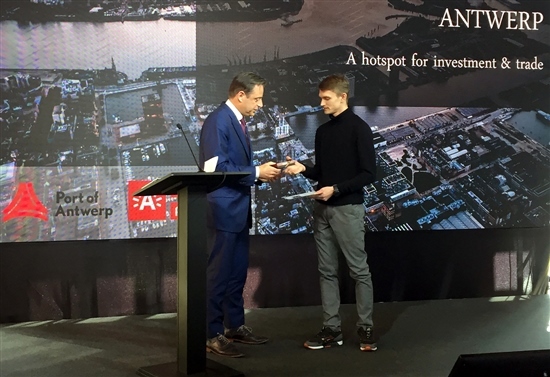 Bart De Wever, mayor of Antwerp, hands a representative of Skolkovo startup CPS Lab an invitation to implement pilot projects at various companies in the port city during the course of a month. Photo: Sk.ru. The delegation was accordingly primarily interested in Skolkovo’s IT startups. Mayor De Wever met with Igor Drozdov, chairman of the board of the Skolkovo Foundation, and Skolkovo’s senior vice president for innovations Kirill Kaem, and was very optimistic about the potential for cooperation, said Vera Bunina, head of international projects at the Skolkovo Foundation. The two sides agreed to cooperate in promoting startups (including with the support of the University of Antwerp) and to take part in upcoming innovations forums in Russia and Belgium. It was the first time such a large delegation from Antwerp had visited Russia, noted Bunina. “The University of Antwerp is a centre for the creation of innovative startups and spinoffs, and is also ready to cooperate both with Skoltech in commercializing innovations, and with Skolkovo startups, to host them for work placements, and create joint projects to get them onto the Belgian market,” she said. The two innovation hubs also agreed to take part in upcoming forums: Skolkovo will take part in SuperNova, an event for tech entrepreneurs and investors that will take place in Antwerp in late September, while the Antwerp delegation was in turn invited to take part in Open Innovations, a three-day tech conference and exhibition hosted and co-organised by Skolkovo that this year will be held on October 15-17.